We – humanity – find ourselves in a situation where, in order to solve the water challenges we have created for ourselves, we need energy to power water treatment systems. Couple this with the facts that accessible forms of energy are becoming increasingly scarcer – and thus more expensive – as well as an increasing amount of water related challenges originating from energy production, and it easy to see that we find ourselves in a classical example of a vicious circle. When considering the commercialization of new water treatment technologies, the above explains why increased productivity is the major drivers for developing and implementing new energy-efficient water treatment technologies. Another driver is quality. In order for increased productivity to be of value to the end user, the quality of the end product has to be up to par. 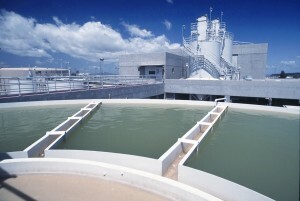 Hence, new technologies delivering increased productivity – with adequate application specific quality of the end product – are sought after in the water treatment market. Of course, in an unsubsidised market, new technologies are only of commercial interest if the payback times of solutions implementing such new technologies are shorter as compared to existing solutions in the market. In today’s water treatment market, new solutions with higher productivity are mainly based on incremental innovation of existing pressure-driven membrane technologies. Here, a hydraulic pressure is used to force the water through microscopic pores in the membrane material. The smaller the pores, the higher the rejection of the membrane towards solutes in the water being treated and the higher the pressure (= the higher the energy) needed to drive the water through the membrane. The high-pressure operation of such systems causes severe fouling problems when the aqueous solutions being treated contain high TDS (total dissolved solids). 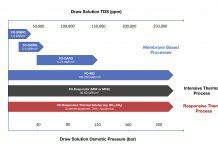 In comparison to traditional pressure-driven technologies, forward osmosis, being driven by osmotic gradients instead of energy intensive hydraulic pressure, represents a radical innovation from the viewpoint of minimizing energy expenditure in water treatment processes. As such, commercially available, high-performance FO-based systems have the potential to significantly outperform traditional technologies when it comes to increasing productivity. Next articleWhy is it challenging to commercialize forward osmosis technologies?